A video clip or a movie generally consists of two parts – image frames and sound tracks. The consecutive image frames present different scenes. While the music and sound track make the video more complete. The viewers can learn the keynote of the video and mental activity of heroes from the background music. Obviously, the audio track is a crucial part of video clips, however, some videos are lack of appropriate music track, and even have been muted for some reasons. For those people who want to add background music to video to enhance the atmosphere, the methods suggested in the followings may be helpful. 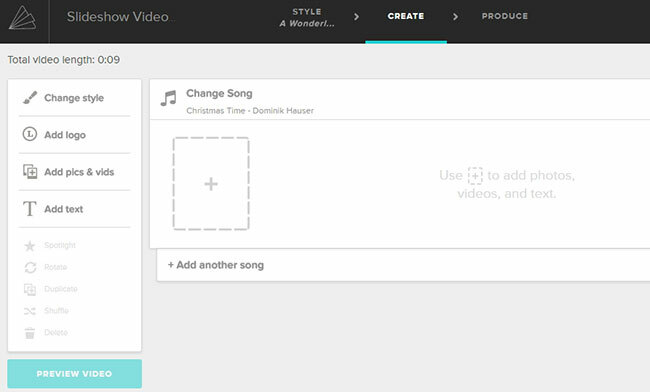 One of the most popular and famous online video editing application is Animoto. This tool offers multiple editing options for users to create photo slideshow and edit video clips. With this editor, you can choose a preferred topic styles that make your video fancier. Also, you can customize the video through adding logo and text. Absolutely, it also empowers users to add favorite songs to video. You may check the steps below to learn how to add background music to video with this tool. Navigate to the site of Animoto and then log in your account. Click “Create” button to start a new project. Click a style you like for the video and then press “Create Video” button on pop-up dialogue. Click “Add pics & vids” tab to upload your local video. Hit on the option of “Change Song” to choose the desired sound track or upload your local audio file. Click “PRODUCE” button to finish editing. Fulfill the info for your video and then click “FINISH” button to generate the video. Click “Download” button to save the video to your local disk. Perhaps, there’re some people afraid that the online application is not so stable when the network connection is poor. For this case, you may consider trying the desktop solutions below. One of the best to use video editing programs is ApowerEdit which is designed to perform video editing jobs for media files. It supports most kinds of image, audio, and video file formats and provides various editing options like trimming, cropping, adding text, filter, and layout. Those editing effects will come into serviceable for users to customize or create videos, such as making birthday video, daily casting, and so on. Absolutely, this program is also efficient to add background music to video. To learn how to operate this program exactly, you can check the instructions below. Launch the program and then add the target video and preferred audio file. Drag the audio file to sound track. 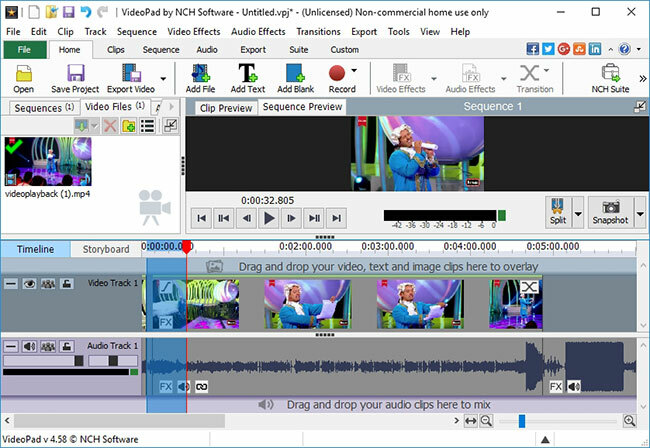 VideoPad Video Editor is also a popular media file editing program that enables users to customize media file based on their preferences, such as trimming, cropping, zooming in, zooming out, adding effects and subtitle. 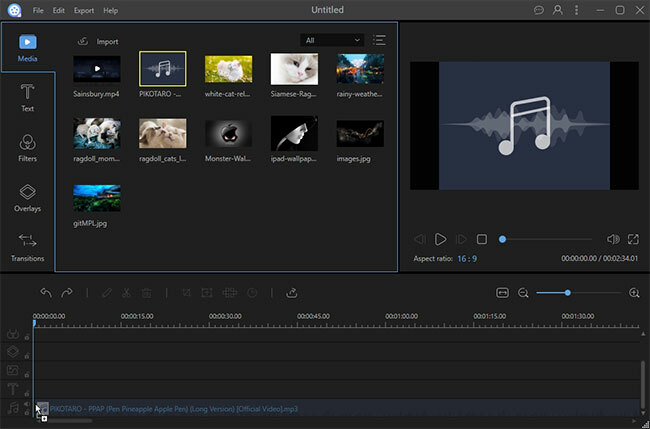 Likewise, this video editor is also workable to add audio to video. Meanwhile, this program is designed with an intuitive interface that enables users to operate it without any hassles. Check the followings to learn the basic operations. Open the program and then add video and audio file into it. Drag the media files to video and audio tracks. Click “File” > “Save Project File As” options and then choose a preferred saving folder. Drop down the menu to select the desired format for output video. 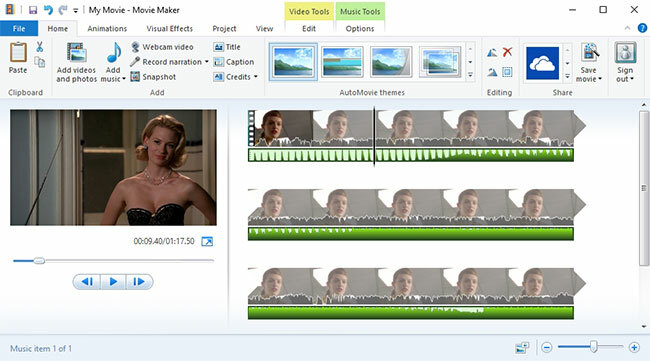 Windows Movie Maker is a desktop video editing application created by Microsoft Inc., which empowers users to perform simple editing jobs for media files (including image, video and audio file), like trimming, cropping, merging and adding effects. This tool can also be used to add background music to video. Since it comes with a simple interface, you won’t find any hassles to operate this tool. Check the instructions below to learn more. Launch the video editor and then add video file into it. Drag music file to sound track of the project. Click “File” > “Save movie” > “Recommended for this project” to generate video. If you want to replace the BGM with the preferred sound track with this tool, you may do as follow. Click the button of “Video volume”. Adjust the volume to zero to mute the video. Drag audio file to the project and then generate the video. The online tool is the most convenient solution to add audio to video. However, the editing process may be unstable when your network is not so good. And its general functionality is relatively simple. For those who prefer more practical funtions, the desktop program would be better. Especially for ApowerEdit which features the most comprehensive functionality.